A gift with purchase pin from Disney Auctions during the Pin-A-Palooza in May, 2004. One of fourteen pins that were created just for promotional gifts with purchase. 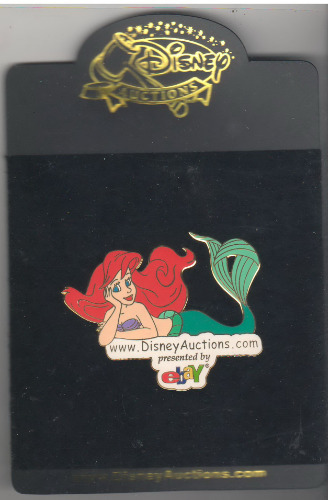 Pin shows Ariel/Little Mermaid lying on her side above the DisneyAuctions.com logo. Logo reads see pin presented by eBay Gold based pin measures 2½" W x 2" H. Reverse has repeating Disney Auctions logo design and is stamped with a plain rectangle reading: Limited Edition Disney Auctions Exclusive China"